The lightweight, flexible "Phoebe" tie shoe is one of easyB's best-selling shoes in England because of its sleek good looks and exceptional comfort. 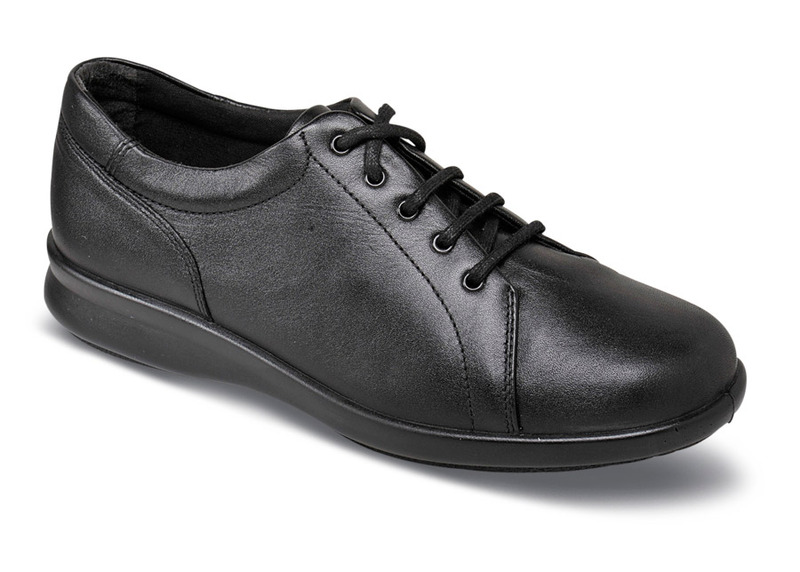 Made of soft black leather with a lightweight air-bubble cushioned sole, it has silky fabric linings, five-eyelet lacing for highly adjustable fit and a removable leather-topped insole that allows for insertion of orthotics. Made in England to fit almost any foot in U.K. sizes equivalent to U.S. women's sizes 5, 6–9 and 10 in 2E; whole sizes 5 to 10 in 4E, 6E and 8E! Limited stock: available sizes as indicated in pulldown.